This privately-run art and boutique hotel offers an art gallery, individually furnished rooms and free Wi-Fi internet. It is in the Oberbilk district, to the south-east of Düsseldorf city centre. The Hotel am Volksgarten offers a breakfast buffet which can be enjoyed along with classical music each morning. Düsseldorf Central Station is 1 km away. The Regional Court (Amts- und Landesgericht) is 750 metres from the Hotel am Volksgarten. The Volksgarten Park, with jogging paths, is 200 metres from the hotel. Guests planning to arrive outside reception opening times can check in via the check-in terminal in the lobby. To receive the access code, guests should contact the hotel in advance. Contact details can be found on the booking confirmation. This family-run hotel in the heart of Düsseldorf offers soundproofed rooms with balcony and fridge. It has excellent transport links and is a 5-minute walk from Düsseldorf Central Station. The Berliner Hof is open 24 hours a day. All rooms include a safe and satellite TV. Internet via cable is available. A breakfast buffet is prepared each morning at the Berliner Hof Düsseldorf. The hotel also has a bar. Guests can park in the hotel's private garage for an extra fee. Berliner Hof is a 1-minute walk from trams and a 3-minute walk from Oberbilker Markt Underground Station. There is a direct underground link to Königsallee shopping street and the Düsseldorfer Messe exhibition centre. Quench your thirst with your favorite drink at the bar/lounge. Full breakfasts are served on weekdays from 6:30 AM to 10:30 AM and on weekends from 7:00 AM to 10:30 AM for a fee. Smart and modern, the 3-star Novum Hotel Maxim Dusseldorf is found in a classic Art Deco building near the Old Town, just a short walk from Friedrichstadt S-Bahn Station. You’ll find a good selection of restaurants in the surrounding area, and for your convenience, the hotel offers 24-hour reception service and free wi-fi. Rooms at Novum Hotel Maxim Dusseldorf are furnished in a modern style, with flat-screen TVs with cable channels and private bathrooms with toiletries and hairdryers. 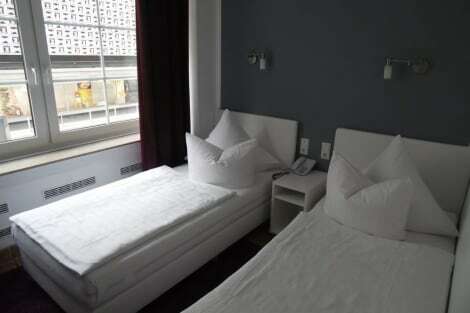 This hotel is located in the heart of Düsseldorf, conveniently close to the main railway station, links to the public transport network and all interesting sights. The old town, the Königsallee, the river Rhine and the government district are all just 2 km away, whereas Düsseldorf airport is 8 km from the property. Recently renovated, this city hotel features a terrace and comprises a total of 38 rooms, spread across 5 floors. Facilities available to guests include a cafe, a restaurant and a WLAN access point. The soundproofed rooms feature light furnishings and an en-suite bathroom with a hairdryer. Satellite/ cable TV and Internet access also come in all accommodations as standard to provide further comfort. Featured amenities include limo/town car service, express check-in, and express check-out. Self parking (subject to charges) is available onsite.